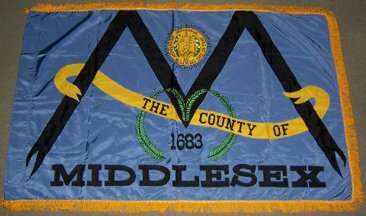 I am the designer of the flag which was created as part of the county's tercentennial celebration in 1983. A likeness of some of the elements of the flag can be seen at co.middlesex.nj.us/profile.asp. 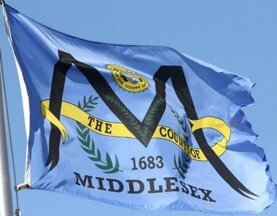 This image with a graded background was picked up off of the Middlesex County website and is only a representation of the flag that they are using there. 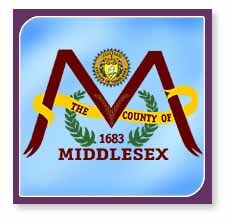 The actual flag hangs in the Middlesex County courthouse and is used for various events. I was given one of three original flags produced in '83. A slightly simplified variant of the flag.